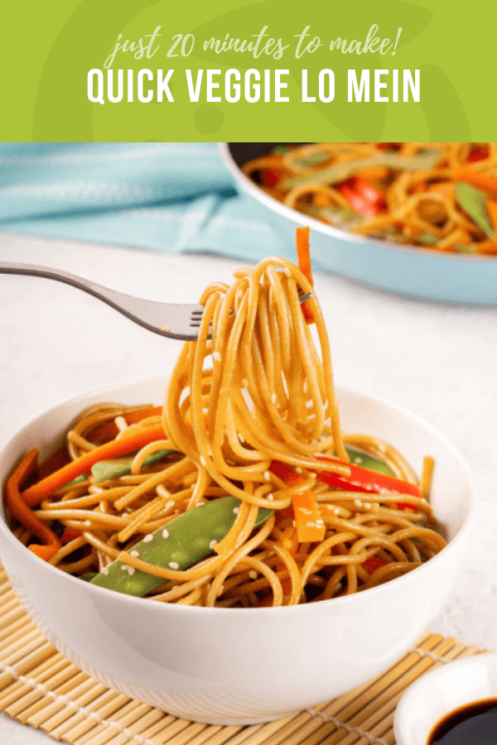 Takeout has nothing on this Quick Veggie Lo Mein! 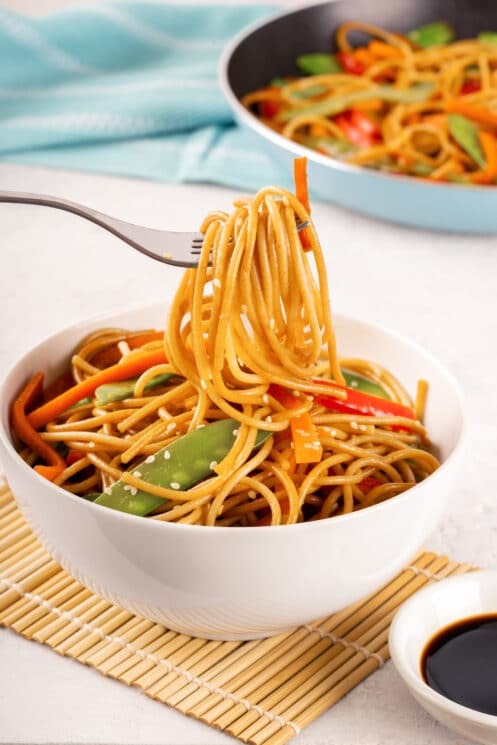 Make this Chinese restaurant staple in just 20 minutes with whole grain noodles and tender-crisp veggies in a sweet/savory/gingery sauce. Aren’t kids funny about veggies? They might reject a veggie at home, then dive right in when the same veggie shows up on their plates somewhere else, like at your family’s favorite Chinese food restaurant. WHY? Maybe the veggies taste sweet there, maybe it’s peer influence, or maybe it’s just the excitement of the new. Whatever the reason, you should definitely try re-creating the magic at home. Because when veggies taste awesome to kids, they eat a lot of them! Here’s a Chinese-inspired recipe that’s super quick to make, loaded with veggies, and generously doused in a sweet and savory sauce. For kids who love takeout Chinese, this one’s sure to be a hit! Both these Chinese noodle dishes are made from wheat noodles with veggies, and have similar flavor profiles. But traditional Chow Mein has a crunchier texture from frying the noodles. 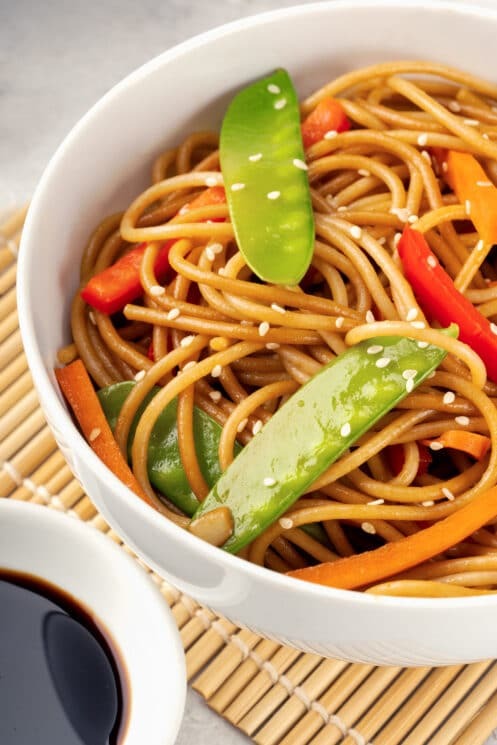 Lo mein, by contrast, uses boiled noodles that are tossed with the sauce and veggies. This Lo Mein doesn’t pay lip service to veggies. Every serving is packed with a rainbow of fresh produce so your kids can get terrific taste and nutrition from this one-pot meal. 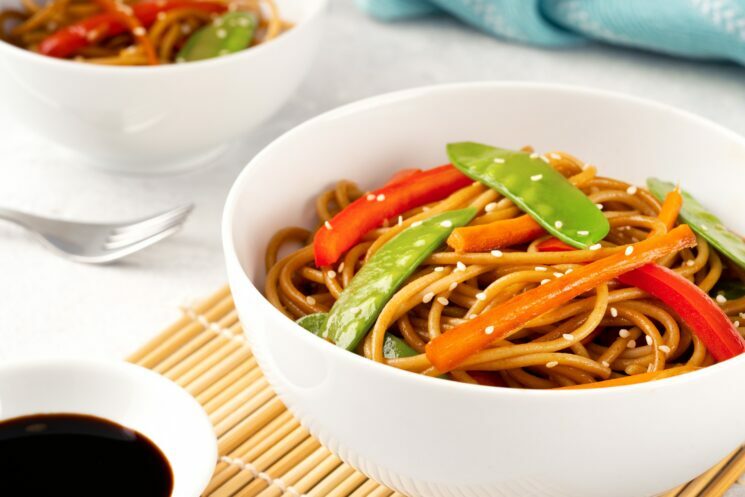 We strongly recommend using whole wheat noodles in this recipe, for two reasons. First, whole wheat noodles give your kids good fiber and nutrition compared to white noodles. 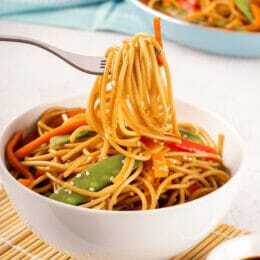 Second, the heartier flavor and texture of whole wheat noodles jive better with the sweet and savory lo mein sauce. There’s a little more cling factor with whole wheat noodles, which is perfect when you’re coating them with a thinner sauce, like this one. We should also mention that the veggies can be flexible in this recipe. We picked three that taste great together (and look so pretty!) but if you have some other veggies in the fridge that you need to use up, don’t hold back. Cabbage, bok choy, celery, and onions are some that we’ve tried and loved. 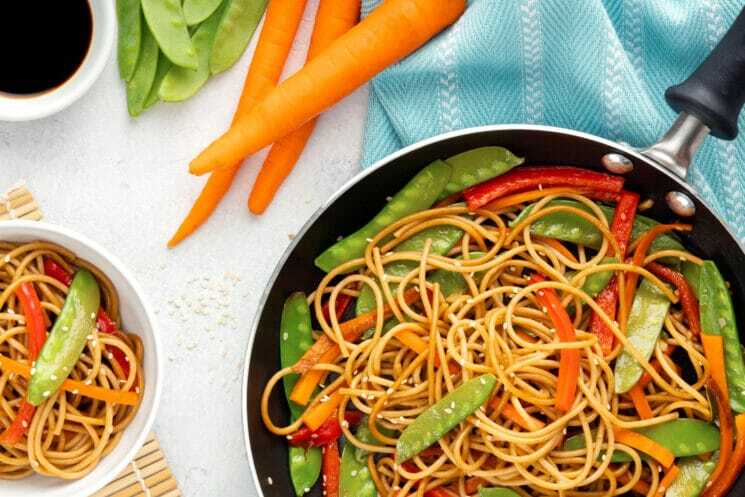 Tender-crisp veggies are KEY to making the yummiest lo mein. You don’t want to end up with floppy, soggy veggies. Then again, raw is a no-go, too! To get that perfect in-between texture to your veggies, use your biggest pan. This lets the veggies cook in a single layer, which prevents them from steaming in all the moisture that’s naturally created by a heap of veggies. Another trick to getting perfectly tender-crisp veggies is to add them to the pan in a staggered fashion. (Don’t stress, we promise this doesn’t add any extra fuss or cook-time.) Add the sturdy, thicker veggies first (the pepper and carrots) and wait to add the delicate peas until the very last minute of cooking. You’ll love the way this dish turns out when your veggies are cooked just right. Meanwhile, whisk together the soy sauce, sesame oil, brown sugar, dried ginger, and rice vinegar in a small bowl. Set aside. Julienne the red bell pepper and carrots. Add in the bell pepper and carrots. Sauté until tender, about 5 minutes. Add in minced garlic and snow peas and cook for an additional minute, until the garlic is fragrant and the peas are bright green and tender-crisp. Stir in the cooked noodles, pour over the sauce, and toss to combine. Serve immediately with sesame seeds for garnish.